Surrounded by huge mountain ranges of the Himalayas and the deep dense forests of Oak, Deodar and Pine on these ranges, rivers flowing down the mountain slopes have already made Shimla, a very special tourist destination throughout the year. For the visitors of Shimla, it is important to know about important places including the important roads and localities of Shimla. To know how and where to visit, it is important to know important localities and landmarks of a place. Here in this article you will get to know about all the important localities of Shimla, the capital of Himachal Pradesh State. Shimla District stands first in terms of urbanization and in terms of population; it has got the third position in the state. The district has been divided into Tehsils and Taluks. You will come to know about the important localities of Shimla district in the following paragraphs. The most important reason why Chotta Shimla is considered as an important locality is the location of Woodville Palace hotel, the heritage hotel. Having important places like Dhobi Ghat, Flowerdale and Knollswood, Chotta Shimla holds the central place of the district as well as remains at the center of the heart of the people, both Shimlaites and tourists. To feel the actual flavor of Shimla , this locality is an ideal one. From here, it is easy to head towards Kasumpti, an important gateway of Shimla. Taradevi Railway Station being very close to Chotta Shimla, it becomes easy for the travelers to reach here and head towards the famous temple of Tara Devi, a must see place for all. Other important places around Chotta Shimla are the Nigam Vihar and Strawberry Hills. The Water Catchment Sanctuary of Shimla is in New Shimla. From this water reservoir, the town gets its water supply. Apart from housing the source of live savior of Shimlaites, New Shimla is having important places like Tutikandi, Phagli, Chaura Maidan etc. in the near vicinity. Shimla Railway Station and the Summer Hill Railway Station make it easily reachable place for everyone. What a body is without heart is synonymous to the Shimla City without Mall. The most important road that joins one part of Shimla to the other and also houses numerous shops, offices and important building along it is the Mall Road. Walking trails on this road, doing window shopping, looking for the delicacies of Shimla, bargaining for small to big items especially the local-made crafts work, Tibetan accessories and fruit-based items are regular scene at Mall. The Mall is considered as the most important place of the capital city. The look and feel of the entire city can be experienced when one steps into the Mall. The Mall Road stretches to meet another important place of Shimla, the Ridge and the meeting point, the Scandal Point has its own history to say. The Mall is located a level below the Ridge. Important offices located in Mall are the Municipal Corporation of Shimla, the Fire House and the Police headquarters of Shimla. Rich heritage of Shimla and its history can be experienced by one when he or she reaches Ridge in Shimla. Shimla changes its color as the season changes. Mother Nature has endless gifts for Shimla. To enjoy the city and its color in summers, winters, and springs, none other than the Ridge is the best place. The Summer Festival, Ice Skating Carnival, spring festival, New Year’s Eve, Christmas and many other events and festivals are arranged at the Ridge. At Ridge, people could exchange their views and share ideas and get enriched culturally, socially and as a human being. It’s through Ridge in Shimla , that many other important places of Shimla are interconnected e.g. The Mall, Jakhoo Hill etc. Ridge has heritage sites like Christ Church, Vice Regal Lodge and many others and keeping them out of the Shimla Sightseeing itinerary would keep the Shimla visit incomplete. The Ridge Sanjauli road is an important connection to other places of Shimla and one of them is the age old Sanjauli Cemetery. The Ridge Sanjauli Road meets the Jakhoo Road that will take you towards the Jakhoo Temple, the most important religious place of Shimla. Lakkar Bazaar of Shimla is not a favorite place for the shopping freaks only. It is a must to see locality of Shimla which have the keen fervor to know this colonial city very well. Going through the mazes of lanes and by-lanes is an experience in its own. The shops with all types of local handicraft items, wooden craft items, furniture, woolen stuffs, Tibetan accessories, dress materials and shoes will definitely take you to the roots of this one of the most urbanized districts of Himachal Pradesh. 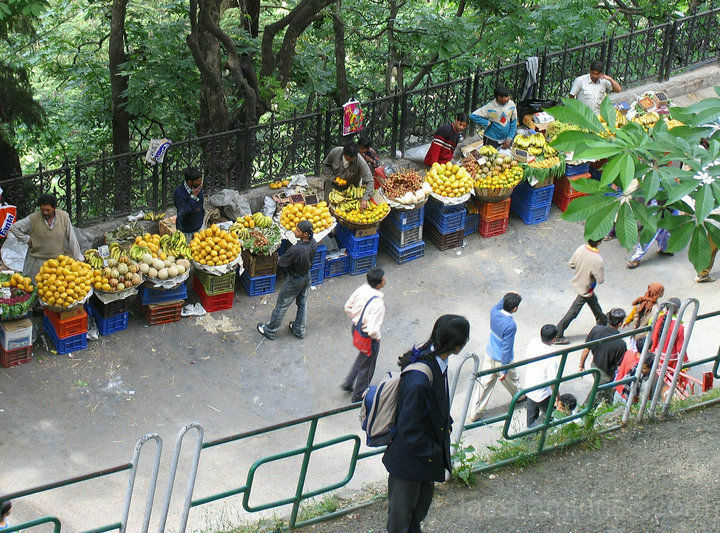 Fruity flavor of Shimla can be tasted at this Bazaar with numerous shops of fresh fruits, fruits juices, dry fruits and fruit items like squashes, jelly, jam and marmalade. Not only has the natural beauty of Annadale but the Shimla Army Museum situated here made it an important locality of Shimla. Annadale is a place where many sports events take place. The place was primarily developed as the playground of Shimla City by the British and still houses the race course and golf course. Picnics are also organized here in great numbers. The Army Heritage Museum of Annadale is not to be considered as a journey of the Indian Army’s past achievements but is an important source of motivation for all Indians. People would actually learn to how they can serve their motherland when they visit this place. The green house here has collection of many plants including orchids. Annadale can be visited on the way to the important religious place, the Tara Devi Temple of Shimla. Hi, No you won't be able to explore them in a single day. Try and spare at least 3-4 days to do so.